When asked about the team’s injury situation after their recent road trip, Kootenay Ice head coach Luke Pierce laughed. 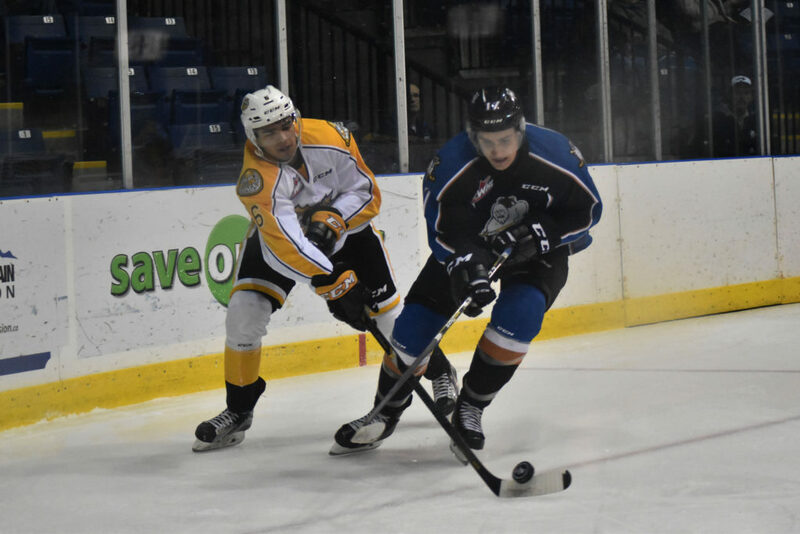 The Ice lost 8-3 to the Broncos last Wednesday, before suffering 8-5 and 4-0 losses to the Wheat Kings on Friday and Saturday. While the defeats were certainly not pleasant, it’s the injuries that will hurt the most. Barrett Sheen, Vince Loschiavo, Ryan Pouliot, and Sam Huston have all returned to Cranbrook with various afflictions sustained between their last home game and their return on Sunday afternoon. Sheen missed Sunday night’s game and is officially listed by the team as being out for five to six weeks. Huston is expected to miss two to three weeks with an upper body injury, Pouliot two weeks with a lower body injury and Loschiavo one week with an upper body injury. Nikita Radzivilyuk, who hasn’t played since late November is two weeks away from a possible return, as well. Injuries aside, despite the losses, Pierce was moderately happy with his team’s play in Brandon over the weekend. It was a wild night. The Ice competed valiantly in the opening period, going into the first intermission with a 3-3 tie, with goals from Loschiavo, newcomer Colton Kroeker, and defenceman Dallas Hines. In the second period, Kootenay gave up three goals while being outshot 19-7. Although a pair of quick goals from Brett Davis and Sam Huston put the Ice back in striking distance early in the third frame, the Wheat Kings ended up sinking the Ice. Despite the loss, Huston’s goal was a big moment as it was the 17-year-old’s first career WHL marker and was scored in his hometown. “It felt amazing to do it in front of friends and family — I had so many of them there,” Huston said with a huge smile on Monday afternoon. “They all filled one box and as soon as I scored you could hear them make so much noise and they just wouldn’t be quiet after that. On Saturday night however, the script changed. The Ice escaped the first period only down a goal, but failed to convert on three back-to-back power plays. The second period was once again rough for Kootenay. The team gave up 22 shots and three goals, while only managing five of their own attempts on net. The Ice gave up 40 shots or more on both nights and are the WHL leaders in shots against, with their goalies facing a average of 40 pucks a night. To deal with the injury situation, the Ice are bringing in some younger players to fill the void. Defenceman Loeden Schaufler of the Notre Dame Hounds from the Saskatchewan Midget Hockey League has already been called up and will play Wednesday night at home against the Prince Albert Raiders as well as on the weekend on the road. Schaufler was a third round Ice pick in the 2015 Bantam Draft. 15-year-old phenom Peyton Krebs is also expected to make an appearance on Wednesday and Friday, although the team is still confirming the details with the WHL. The Ice are also planning to announce a new leadership group today before practice, which should help the young, rebuilding and struggling team solidify its identity. The Ice’s next game is on Wednesday night at Western Financial Place against the Prince Albert Raiders, the last place team in the WHL standings.